Note: Before you read through here, you need to be aware that I’m using a new WYSIWYG editor, and it’s not working the best for me. It’s better than the default editor, but I’m not an immediate fan like I am for other WordPress plug-ins. Pillows are easy projects, and they needn’t cost much. The pillow I made for my nephew has piping. Piping just makes a pillow looksharp. Don’t you agree? My kids certainly noticed when I showed them this pillow. If you haven’t used piping before, here’s how I did it. When compared to making a non-piped pillow, it really doesn’t add much time at all. Because my nephew likes Star Wars, Legos, and football, and because the fabric doesn’t have Star Wars or Legos fabric, I went with football fabric. This is polar fleece because there were no suitable quilting fabrics. Because I was making a 12″ square, I put focal points of the fabric pattern in the center of the pillow. I know this is somewhat wasteful of fabric, but scraps can be used to something that needs to be firm rather than soft (like a stuffed doll or animal). Or you can toss them in the trash. I didn’t have very much waste, so I tossed it. 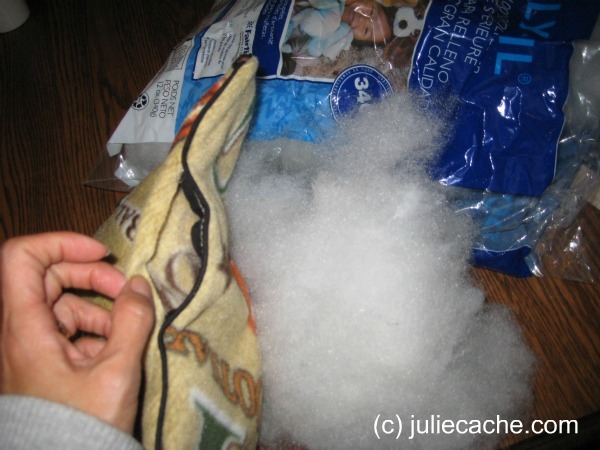 I knew that I had polyester stuffing on hand for up to a 12″ pillow (most of a 340g bag). Snag a pillow form or bag or two of stuffing when they go on sale at the store. I almost always have some in the house. Here are my two squares of fleece. You can see my clear ruler and gray cutting mat. They make my cuts very accurate. I got them on sale a looooooooong time ago. They older ladies behind me at the cutting counter congratulated me on getting such a good deal. If you are using scissors, I suggest using a measuring tape and drawing lines with a marker on the reverse side of the fabric, especially with a large print pattern or solid. Overlap the ends. I’ll show another picture of this further down. Now to make the pillow special with piping — just lay the piping on the right side of the fabric. It sticks to the fleece, so no pins necessary. Just pick one square of fabric (one side of the pillow), then stitch it in place, as close to the piping as possible. I think my presser foot was on top of the piping. Maybe a zipper foot would help you. This looks much better. Piping looks right. On to making a regular pillow case! Remember to keep an opening for the stuffing! Leaving a gap in my stitches allowed me to stuff the pillow. All that’s left now is to hand stitch the gap! Here is a close up of the ends of the piping. They are crisscrossed inside the pillow, which looks funny. 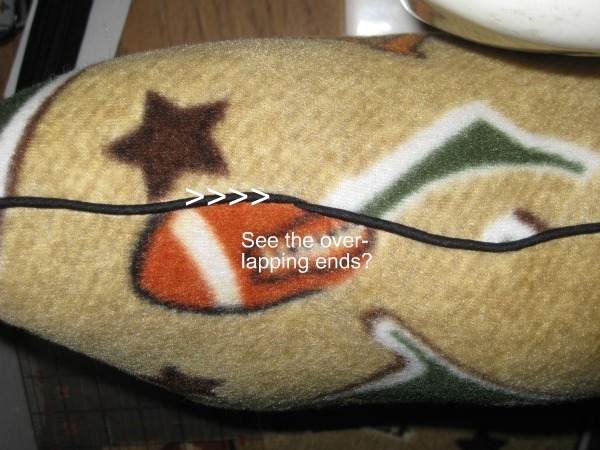 Outside the pillow, the ends are barely detectable. This entry was posted in crafting and tagged crafty monday, piping, sewing, tutorial. Bookmark the permalink.